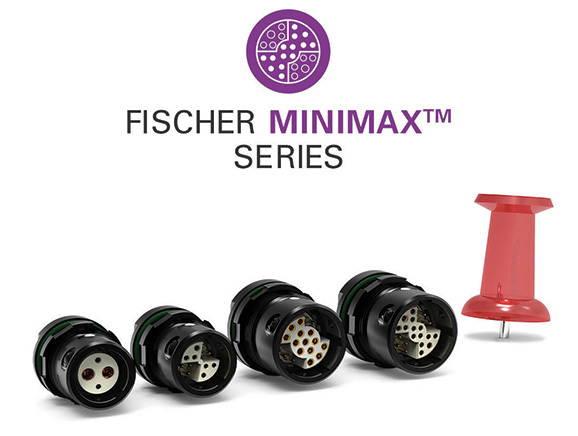 Fischer MiniMaxTM Series: High density, signal & power, miniaturization. This is trending in the connectivity market: application designers need solutions with high-density and high data transmission rates over long distances, while reducing space and guaranteeing performance by means of rugged miniature solutions. The goal: to pack more functionality into smaller devices. The benefit: more performance with more compact and lighter equipment. Military organizations throughout the world are indeed working hard to lighten the load that soldiers carry into battle, and are looking at connector and cabling solutions as one place to make improvements. For troops to have the best shot at surviving and winning wars, they must carry a collection of equipment that includes, among other things, communication devices, weapons, ammunition and batteries. The added weight also reduces the amount of food, water and ammunition a soldier can carry. So every ounce of equipment carried must improve communications, agility and lethality for soldier survivability. And contractors must make sure that miniaturization happens now, not years down the road. This spring, Fischer Connectors launched new miniature, lightweight, rugged connectivity solutions which are easy to use and ensure premium performance, especially in harsh environments: an even smaller ultra-miniature connector as an extension of the already miniature high-density power and signal product line, the Fischer MiniMaxTM Series; and a single fiber optic connector within its Fischer FiberOptic Series. Today’s innovation drive in miniaturization and data transmission also concerns the ultra-portable, miniature, lightweight and extremely tough USB Fischer Rugged Flash Drive, specially designed for safe transportation and storage of sensitive data in harsh environments: a new version of it will be launched at Eurosatory next June in Paris. Fischer FiberOptic Series: Robust, optical performance, easy cleaning. The smaller MiniMax version called MiniMax 06 can include up to 12 power and signal contacts in a footprint of only 10 mm. This corresponds to a density factor* of 0.83 – a unique technological feature for a connector with standard 0.5 mm contacts. The new MiniMax 06 connector also includes a new unique configuration with two signal and two high-power 1.3 mm contacts for applications needing 10 Amps or more power, doubling the standard 5 Amps current rating of the existing MiniMax product line. With its new smaller version, the high-density signal and power Fischer MiniMax™ Series is now available in two sizes with receptacles of only 12 mm and 10 mm footprint. The Series is a unique miniature signal and power solution that provides various configurations ranging from two signal and two power connections up to 20 signal and four power connections in one miniature connector, replacing multiple others. This saves space and weight, giving designers more flexibility and lowering the total cost of ownership. They are also rugged, with IP68 (2m/24h) sealing both mated and unmated, an unbreakable keying system, and over-moulded cable assemblies. Push-pull, screw and quick release locking systems make them easy to connect and disconnect over and over for more than 5,000 times. 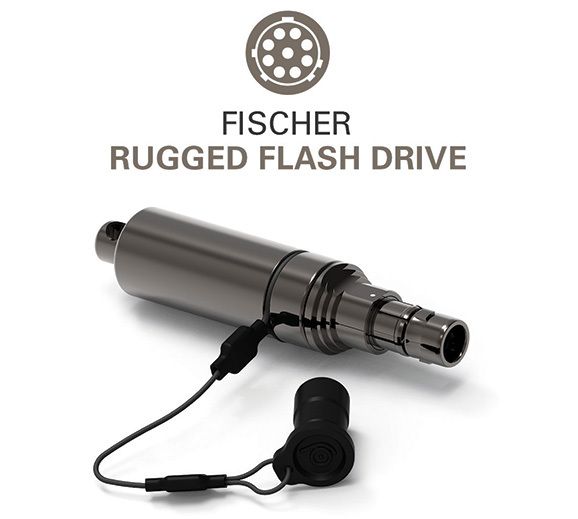 A new version of the Fischer Rugged Flash Drive will be disclosed at Eurosatory next June. When optical performance and reliability are key, the pre-cabled Fischer FiberOptic Series is the ideal solution for indoor, outdoor and extreme applications, ensuring high-quality optics and efficient large data transfer. Well-known for its robust and faultless optical performances in any conditions, combined with easy use, cleaning and maintenance even in the field, the series has been recently extended with a single fiber optic connector (FO1). This miniature, lightweight, rugged connectivity solution is available either in pre-configured reels or integrated into custom assemblies, and is ideal for defence and security applications. UPC & APC polishing reduces insertion and return losses, making devices more secure, while IP68 sealing provides highly valuable device protection. The push-pull locking system allows quick and easy connections and disconnections, making the FO1 connector ideally suited for outdoor environments. Its ergonomic design makes it easy to handle, and the removable sleeve holder (monobloc mate adapter) ensures that end faces can be cleaned easily, keeping electronics in top condition. The FO1 connector also addresses design engineers’ needs for flexibility and efficiency. The product line’s main benefits remain the same. But this smaller product has been designed to be even lighter and more flexible so that it is easy to integrate into existing solutions, saving time and money for customers. 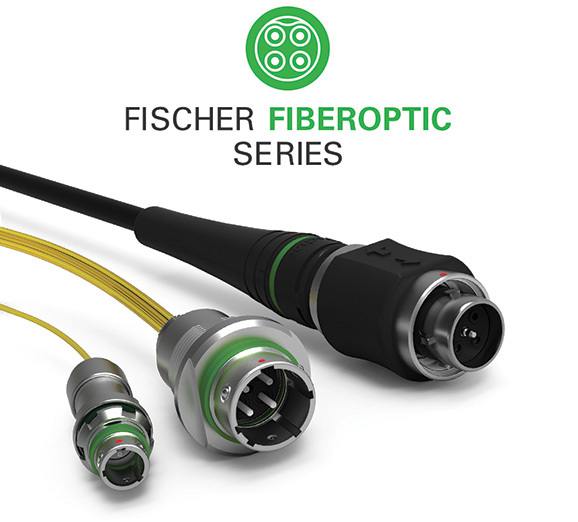 The Fischer FiberOptic Series already includes two versions: a rugged fiber optic connector with two or four fibers, and a rugged hybrid connector with two fiber channels and two electrical contacts. A new product range extension of the Fischer Rugged Flash Drive is scheduled for June, to be disclosed as a world premiere at Eurosatory in Paris. The Fischer Rugged Flash Drive is an extremely tough memory stick designed for safe storage and transportation of sensitive data in harsh environments. It is suitable for use with ruggedised computers. The unique Fischer circular connector interface, combined with durable encapsulation technique, guarantees data safety in case of loss or theft. The flash drive is equipped with high-speed flash memory, is signalling and protocol certified, and has a standard capacity of up to 128 Gb. The Fischer Rugged Flash Drive is waterproof down to 120 metres and is resistant to extreme operating temperatures (-40°C to 85°C). The data can be accessed quickly and securely via the Fischer UltiMate™ Series connector interface. As a reminder, the durable Fischer UltiMate™ Series connectors are best for tough applications when weight matters. These rugged, compact, lightweight, sealed connectors and cable assembly solutions are ideally suited to withstand a variety of severe environmental, industrial and chemical conditions. They have extremely robust mechanical keying, IP68/69 sealing even unmated (tested on request up to 120m submersion for 24 hours), and 360° EMC shielding using a grounding contact ring. They also offer exceptional shock, vibration and corrosion resistance, and can operate at temperatures from -55°C to 135°C. * Density factor = receptacle diameter divided by the number of contacts available in that receptacle size. Fischer Connectors has been designing, manufacturing and distributing high performance connectors and cable assembly solutions for more than 60 years. Known for their reliability, precision and resistance to demanding and harsh environments, Fischer Connectors’ products are commonly used in fields requiring faultless quality. Primary design and manufacturing facilities are located in Saint-Prex, Switzerland, with subsidiaries and distributors located worldwide.